Well, success! I managed to spin 10, that's right 10, skeins of yarn for my first Tour! I didn't think I was going to be able to keep up with the everyday spinning but I did. The fibers a spun were either Nest Fiber Studio or Pigeonroof Studios. All but one of these fibers are superwash merino. The purple singles by are superwash merino/merino/silk by Pigeonroof Studios. I spun a total of 2,467 yards not counting the n-plied mini skeins I got from the remaining singles. I'm very proud of myself and can't wait to start knitting them up! 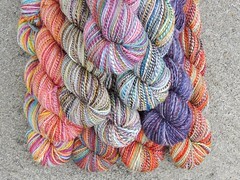 These are all Nest Fiber Studio and Pigeonroof Studios yarns.